What to Eat Every 2 Hours for a Diet Plan? In 2009, the Centers for Disease Control and Prevention reported that the obesity rate for adults in the United States reached 26.7 percent. Americans are consumed with finding an easy solution to the obesity problem. By simply eating natural foods and small portion every two hours, you can improve your health and lose weight without going hungry or spending thousands of dollars on weight-loss supplements or surgery. Eating five to seven small meals a day helps speed up your metabolism, improves energy levels and prevents muscle loss. According to Human Kinetics, when many hours pass before you eat, your body's metabolic rate slows down to conserve energy. Eating every two hours keeps your metabolism high and your insulin levels stable, which keeps your energy up. Additionally, long periods without food may cause your body to break down muscle tissue for energy, resulting in a slower metabolism. It is necessary to maintain lean muscle mass for an elevated metabolism, because muscle mass burns more calories than fat mass. Every meal should contain a portion of lean protein. Protein helps to preserve muscle mass and keeps your appetite at bay, because it takes longer to break down than carbohydrates. Use the palm of your hand to estimate the appropriate amount of protein to consume in your meals. Some protein sources are skinless chicken or turkey breast, fish, cottage cheese, egg whites and whey protein. It is essential to consume fruits and vegetables daily to ensure you are getting enough fiber for a healthy colon and your daily vitamins and minerals. Consume green vegetables in most of your daily meals, and eat fresh fruit in one or two of your daily meals. Fruit is best consumed in the morning or after exercising because of its higher sugar content. Slow-digesting carbohydrates, such as oatmeal, potatoes and whole-grain rice, breads and pasta, can be consumed in all meals or just your first four to six meals of the day. Slow-digesting carbohydrates give your body and brain the energy needed to properly function. Eliminating this food source can cause serious drops in your energy levels and be detrimental to weight loss. Use your cupped hands to determine one serving size, WeightLossforAll.com advises. If you prefer to consume fewer carbohydrates during the day, it is best to eliminate them in your last meal or two of the day so that your energy level is not affected. Consume healthful fats in most or all of your daily meals to keep your appetite and energy levels under control and to maintain normal body functions. 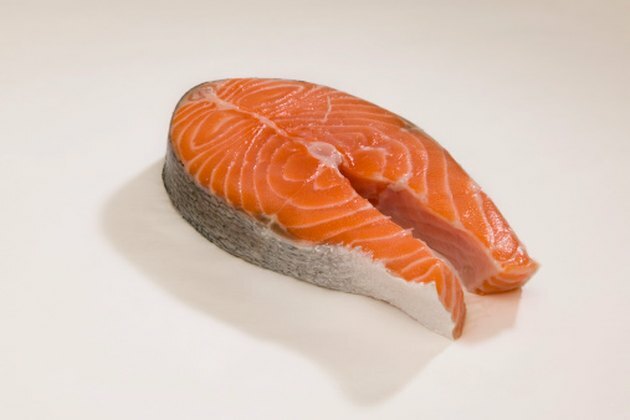 When incorporating fat into your meal plan, choose foods such as fatty fish, including salmon, natural peanut butter, nuts, seeds, flax seed and olive oil or canola oil. A portion of fat is about 1 tsp. for oil and peanut butter, about of 1/2 oz. of nuts or 1 tbsp. of seeds, Cleveland Clinic reports. Cleveland Clinic: What's in a Serving? What Happens if I Workout Without Eating? Is 10 Grams of Fat a Lot for a Meal?